According to Forbes, if there’s weak area of digital marketing programs, it’s analytics. In 2014, 37% of companies with an online presence were in desperate need of data analysts. This percentage has most likely increased in 2016, because everything has since moved toward data: mobile data, social media data, campaign data, performance data, even data on how we should track data. Companies are finally realizing that the root cause of failure with digital marketing isn’t lack of creativity for ads and content, but rather the inability to correctly monitor, collect, and interpret data. After all is said and done, the single most perplexing question for anyone in digital marketing is: How can I measure the effectiveness of my campaign? Most entrepreneurs and business owners fall back on soft metrics such as “page views”, “dwell time”, or “social signals”. But there are better ways to evaluate the performance of your site. Marketing analytics has two major implications. The first one extends to brands and agencies that require heaps of data to manage their campaigns. The second implication extends to the world of SEO & content marketing, where data is used to strengthen online presence, enhance the customer’s journey, and improve brand awareness. Step #1 – Identify your Business Objectives. Identifying your objectives is more difficult than it sounds. Think really hard about what you are doing and why you are doing it. Step #2 – Associate Different Goals with Each Objective. Drilling down to identify goals for each objective requires implication from analysts, marketers, and managers. You will also have to answer several questions regarding your acquisition and behavior goals. Identifying these goals will provide clarity & help you outline a digital strategy. Step #3 – Identify your KPIs (Key Performance Indicators). For each goal, you will have to identify a relevant KPI (e.g. conversions, loyalty, branded traffic, number of downloads, etc.). KPIs will help you understand how well you are doing against your objective. Step #4 – Identify your targets (numerical values used as indicators of success/failure). Targets will help you concretize your campaign and marketing initiative. These metrics can be identified with the help of historical performance data and other sources. Pro tip: Settle for feasible targets. Step #5 – Focus on Valuable Segments for Analysis. This step is crucial. When you log into your Google Analytics account, or any other analytics account for that matter, it is easy to become overwhelmed by the amount of data available. You will have to exercise discipline and only work with segments that are relevant to your objectives and goals. Now that your purpose is clear, you can delve into the nitty gritty of marketing analytics. As mentioned previously, the world of analytics is terrifyingly vast. There are multiple types of metrics that cover different aspects of digital marketing and even more tools that do pretty much the same thing. Google Analytics is, without a doubt, the best & most comprehensive web analytics tool. It is available for free to any webmaster, but you can also purchase a Premium package for enterprises. From your Google Analytics account you can view Demographic Data, User Interests, Behaviour (bounce rate, dwell time, conversions, impressions etc. ), top performing pages, traffic sources, and more. You can also set-up eCommerce goals, sales funnels, and compare metrics against each-other. Ahrefs started out as a backlink tool, but the company expanded its services and it know offers position tracking & content exploring tools, crawl reports, and site explorer. You can use Ahrefs to track changes in your campaigns, keyword movements, new & lost backlinks, domain health, and critical or non-critical errors on your site. With a new and enhanced dashboard, Ahrefs is slowly transforming into an all-in-one SEO power-suite that will enable its webmasters to track key performance indicators for their campaigns. At its core, SemRush is a keyword research and competitive analysis tool. The extended plans of the software will allow you to set up site audits (to evaluate the health of your site), position tracking (for targeted keywords), a brand monitoring tool, and social media tracking. SemRush can also give you “SEO ideas” based on your site’s performance. As you can see, SemRush has a plethora of useful features that will help you monitor the performance of your site. However, its competitive analysis capabilities are undoubtedly the most valuable ones. In digital marketing analytics, the ability to examine the strategies applied by competitors is invaluable. Using SemRush you can compare your competitor’s keywords, link profile, organic movements, and more with your own. Adobe’s motto is “Don’t reach your customers. Know them”. Deliver the ultimate customer experience. To help its users do this, the Marketing Cloud brings together different forms of data and content. With Adobe’s all-integrated tool you will have a 360 degree vision of your site’s performance. Among the tools many features, I will mention the unparalleled real-time web analytics, segmented data, and predictive analytics. HubSpot’s software is woven into all of my content tools. With this incredible tool you can quickly optimize every aspect of your site, because it offers you clear instructions on what is wrong and how you can fix it. Couple this powerful software with the free Marketing Grader and you’ve got yourself one serious set of tools. Social media market analytics tools are divided in two main categories: social media measuring, which allow you to monitor the performance of all S.M. activities, and social media listening tools, which will enable you to monitor relevant online conversations based on trends and keywords. Crimson Hexagon helps “the world’s smartest brands use insights derived from social data to drive strategy across their organizations.” With this comprehensive tool you can measure what truly matters & find the answers that your online strategy really needs. I strongly recommend that you schedule a demo with Crimson Hexagon, to see what the tool is capable of. With Brandwatch you can monitor, analyse, and utilize online conversations surrounding your topics, brand, and competitors. This tool is extremely helpful for increasing brand awareness because it has global reach, in 27 languages. I’ve been a huge fan of Klout ever since it was released. This simple, yet extremely effective social media tool, allows you to connect most of your social accounts, including Facebook, Twitter, Linkedin, and Pinterest. With Klout you can explore content that you are interested in and share it through your social channels, and discover influencers in your field. You will also be assigned a “Klout score” based on your influence on different mediums. Buffer is one of the best social market analytics tool. 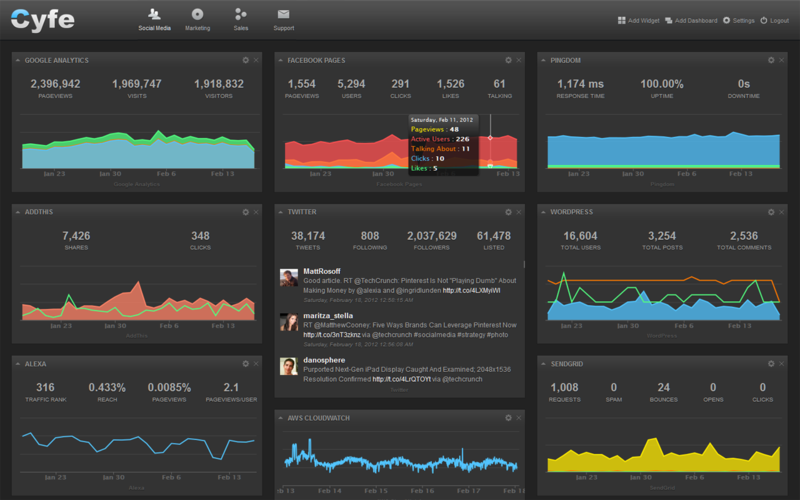 With it you can monitor engagement stats for every update you post on LinkedIn, Google+, Twitter or Facebook. The tool also offers you a broad perspective of all your social media marketing efforts. One feature that I really enjoy is the Top Tweet/Top Post badge that appears every-time a post goes above-and-beyond in performance. Followerwonk is a free Twitter tool developed by the Moz team. It enables users to analyze detailed breakdowns of their followers & activity. Furthermore, with Followerwonk you can view relevant information of other Twitter users by simply writing down their username. By consistently using Followerwonk you can find the best times to post, because the tool shows stats like when followers are online. In addition to this, followers are organized into categories like activity, follower count, total tweets, and social authority. Bit.ly isn’t just an URL shortener. As many marketers already know, the web-based tool can also be used to evaluate the performance of short-links through a crisp interface. With Bit.ly’s analytics tool you can view number of clicks generated by the URL, time, geographic location, referrers, and more. Granted, Bit.ly’s information may not be as detailed as that of Google Analytics, but it gives you a great way of monitoring content performance. A fellow marketer introduced me to Piwik several months ago. Although I wasn’t too excited at the idea of downloading the program and hosting it on my own server, I realized that it’s a small price to pay for a free, in-depth analytics program. If you’re new to the world of analytics, I don’t recommend using Piwik, as it has a rather complicated dashboard. Furthermore, setting up the tool will require some time and patience (the dashboard is comprised of widgets that can be rearranged). Piwik offer many features that are similar to those of other analytics programs, such as visitor maps, keyword research, row evolution, tracking, etc., but what sets it apart from competitors are the unlimited data storage & mobile app features. Cyfe is an analytics tool that has been featured by several online publications. You can use this tool to monitor multiple websites (on different platforms). Cyfe will help you amalgamate metrics with the help of intuitive groups, segmented dashboards, and more. Clicky prides itself on offering real-time, in-depth results similar to Google Analytics, but on a much cleaner interface. With this tool you an clearly view every visitor, what they visited, where they are located, who referred them, how long they stayed on the page, etc. Furthermore, Clicky offers Twitter integration and a heat-map tool (similar to CrazyEgg), which sets it apart from competitors. Scoop.it is a content curation & analytics tool that can be used to share posts into any mainstream social tool. Analytically, the software allows users to measure comments, number of shares, visitors, views, reactions, and more. Scoop.it also integrates with Google Analytics and offer great support materials (case-studies, demos, etc. ).